YOU NEED Yarn (100% cotton, 156 m / z 50) - 450 (550) g of mint-blue; Knitting needles № 2,5; circular needles number 2.5. GUM : Odd number of loops. Facial rows: edging, alternately 1 purl, 1 facial crossed, finish 1 purl, edging. Purl rows: edging, alternately 1 face, 1 purl crossed, finish 1 face, edge. An even number of loops. Facial rows: edge, * 1 wrap, 2 knit the front loops together with the inclination to the left (= 1 remove the loop, like the front one, 1 front, then stretch it through the removed loop), from * constantly repeat, edge. Purl rows: edging, * 1 nakid, 2 knit loops together purl, from * constantly repeat, edging. 6th row (= purl row): knit each loop with a cross thread of the corresponding loop of the 1st row together purl. fold - 6 rows = 0.5 cm. 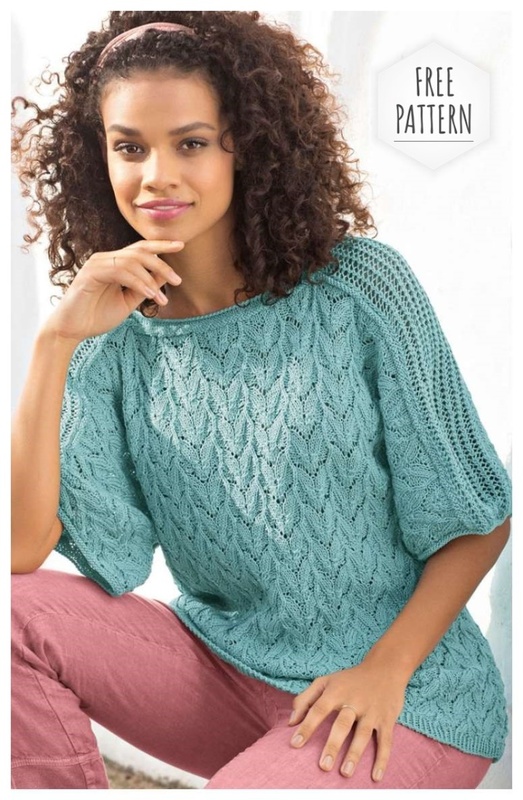 Details of the shoulder knit separately across and at the end sew between the front and back. Arrow on the pattern = knitting direction. Dial on the spokes 171 (199) loops and for the strap tie 2 cm with an elastic band. Continue to work the main pattern. After 36 cm = 122 rows from the plank, for the sleeves on both sides, dial 1 x 42 new hinges and, on all 255 (283) hinges, continue to work as agreed. patterned. Through 52 cm = 176 rows (55.5 cm = 188 rows) from the plank fold. Then close all the loops, with an average of 71 points forming a neck; the outer parts of 92 (106) sections are shoulders and sleeves. Type 24 loops on the knitting needles and knit with a mesh pattern. Through 29.5 (34) cm from the initial row close all loops. details of the shoulders sew to the outer 29.5 (34) cm in front and back. For the strap, dial on the circular needles at the edges of the front and back of the 71 loop, on the edges of the shoulder parts on both sides, 18 loops and on all 178 loops tie 4 circular rows of facial. Then close all the loops as facial. For sleeves, dial on the spokes along the edges of the sleeves with 94 (114) loops and tie 1 purl row with purl and 2 rows with purl stitch. Then close all the loops, like purlins. Run side seams and sleeve seams.